The Illuminati are a rocking trio hailing from Toronto, Canada. Recently signed to the upstart label Liquor and Poker Records, this EP is meant to gives fans a brief taste of what this band is all about, leading up to the release of their full length debut, On Borrowed Time. Liquor and Poker is helping up and coming heavy rock and metal bands get the opportunity to shine in the spotlight. Also, the label has veteran bands such as The Hellacopters (who just released a very fine album) and Hanoi Rocks on their roster. Add The Illuminati to the label's growing list of promising heavy rock bands that it has signed. Although short and sweet, this EP is diverse enough to give the listener a very good idea of what The Illuminati are about. 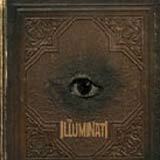 Like other Liquor and Poker bands, The Illuminati's sound is firmly planted in heavy rock sounds of the 70's and 80's. I hear a good mix of Motörhead, Foghat, and Lynyrd Skynyrd in the short EP. The leadoff track Lemmy Know boasts a Motörhead like heaviness (as the title might imply), featuring plenty of extended, flashy guitar solos. Salon Kitty is next, a heavy boogie rock tune with catchy guitar work, and heavy, pounding bass performance. The lead vocals are powerful and energetic, again matching up well with the flashy guitar solos that permeate this track. Wingspan is a groovy track with an infectious rhythm guitar leading the way. Another gutsy lead vocalist performance is a shining moment here, as are the guitar licks. The heavy bass presence adds a slight stoner feel to the song as well. Next up is a bit of a surprise, On My Way Back Home… Again. This is a short (just under two minutes) track that starts with what sounds like a heavy Motörhead type of riff, but quickly develops into what I'd chararterize as a metalized country tune. The heaviness of the song mixed with a Skynyrd like southern fried rock actually works very well. This type of thing could have flopped pretty hard, but The Illuminati pulled it off quite well. Had someone described a song like that to me before I had heard it, I'd probably shake my head and laugh, but this is actually pretty good. All The Time In the World and Absinthe Makes The Heart finish off the EP with a modern take on the heavier side of fun 70's rock bands such as Foghat. That last sentence is a really good way to sum up the sound of The Illuminati. As I said earlier, this EP shows a lot of promise for this Canadian trio. Their fresh take on a straight forward, but fun style of rock makes for an entertaining listen. The band stays away from any cheesiness, and manages to keep things pretty heavy from start to finish. While I do enjoy this music quite a lot, I don't think any of these songs quite meet the definition of "killer" status; the type of songs that stay with you for a long time. Since the band has only been around for three years, continued growth in the songwriting department is sure to follow. The guys certainly play their instruments very well, and the lead singer is quite the charismatic type that is perfect for this music. I'm a big fan of the vibe and sound of the band itself, so with some growth and improvement in terms of songwriting, these guys will certainly make a nice career for themselves. Don't take my word for it, you can order this EP for $3 from the label's website (link at top of review), and decide for yourself!